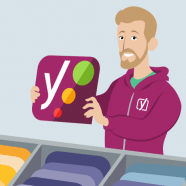 I’ve always felt lucky blogging for Yoast.com. As I wrote before, I have an entire blog team that makes sure my post gets scheduled, is free of grammar or spelling errors and they publish it on social media. So I ‘only’ had to come up with an idea, which the team often helped me with, and type the post. I decided that if I ever were to outsource things on my own blog, it would be things like promotion and social media. And then the inevitable happened. After I finished my previous post, I got a message: “Caroline, from now on, please write your own introduction for Facebook, Twitter, and the newsletter. Here’s some information for you. If you have any questions, let us know!” Hold on! Yes, I have questions! Starting with: “How do I do this?” and: “Do you have any idea how difficult it is to write short messages? There’s a reason I’m not active on Twitter!” And, so began my struggle, and search, for the ultimate social media messages. Because truthfully, I’d rather type a 2000 word essay than one sentence for Facebook. When you’re reading this, I’ve already grabbed your attention. You’ve already made it down to this point in my post, which means that you want to read my message. On social media, I can’t spend over a hundred words to make my point. If I do, you might not click, you might scroll past my message and you’ll never see my post at all. And that’s how I started my two-day research. Two days? Yes. I, of course, started rather late with this blog post and had almost no time to conduct proper research. So, all the information in this post is based on my common sense – and I’ll teach you how to use your common sense too! Oh, how amazing my job is. Truly. Well, apart from having to write my own social media messages now. When do you click on a Facebook message? When do you hit the like button? When do you leave a reply? And when do you take the effort to go to someone’s profile and visit their domain through Instagram if there’s a ‘link in bio’ message underneath a photo? Those questions were the most important for me the last few days, to figure out what the perfect message entails. To find the answer to these questions, you need to know who your audience is. For my blog, that’s a rather easy answer: the goal audience for my blog is me! And people like me, of course. But, I started my blog because I love writing. I’m right in the middle of my audience: young mothers (and fathers, of course) who are struggling with parenthood and want reassurance that others are struggling too. I want people to laugh at my stories, but also to take their struggles and life a little less serious, in order to enjoy life more. While people who visit my blog always tell me I have a great sense of humor – except for my husband, he still claims I have no humor at all – my Facebook page didn’t reflect my blog at all and come to think of it, I didn’t even like Facebook. I started experimenting on Instagram: my photos were more blunt, I used a lot of hashtags (thirty hashtags seems to be the maximum) and I treated Instagram as if I was talking to my best friend. Immediately, my engagement went up. People responded to my photos with more than just a heart, they actually left messages! I started to get to know my audience more and more, and then a few days ago I decided I’d use the same strategy on Facebook. I took a notebook and wrote down when I was interested in a Facebook post from another company, and when I scrolled past. And, although this is personal (and not perfect) research, this works for me, since I am a reflection of my own audience. I made notes on the posts I clicked on: what was the message they wrote? What was the title of the post? Did the image appeal to me? And when did I decide not to click on a post? I found out that I click the link if these three aspects: text, title, and photo of the post, appeal to me. There are messages I saw multiple times but I didn’t click them, because the Facebook image wasn’t appealing enough, or the leading text was too vague or didn’t catch my attention. Facebook, Instagram, and other social media are extensions of your blog. Try to find the reason why you follow someone on Instagram, hit the like button on Facebook or retweet a message on Twitter. It’s probably because you feel connected to someone or to the brand. Those social media accounts should reflect the blog, in this case. By writing and rewriting your Facebook messages a few times, you will eventually find the voice that fits your brand. You can’t be as elaborate on Facebook or Instagram as you are on your blog. You need to catch people’s attention and get them to click that link to your website. With Facebook, you can easily re-post a post that’s a couple of months old. Check which posts performed less: you can look that up on your Facebook page under ‘Statistics’. Check the accompanying message you wrote, try to rewrite them and see if you can gain more clicks. As much as you need a blog planning, you also need a social media planning and a strategy. If you post on Facebook only once a week, you probably won’t reach a lot of people. However, if you post once or twice a day, you’ll see your reach going up. Those posts don’t always have to be a link to your blog, especially not when you only blog every other day or once a week. Share images, ask questions, share links to other blogs in your niche or share quotes. Look at your competition and try to find a new angle to implement on your social media profiles. And now it’s time for me to write a nice introduction for social media so you’ll actually end up clicking and reading this message. Wish me luck. Oh and please drop your tips on me as well! You have no idea how much I learn from the comments you leave on my blog posts! The post Writing great social media content for your blog appeared first on Yoast.